One of the things I have learned about life is that if I'm willing to be creative, I can have many of the things I'd really love to have, within the limits of my financial and health situations. I've always loved the idea of a kitchen garden - somewhere there's always fresh fruit and vegetables, lovely fresh herbs, ready to be picked just in time to be used for cooking a meal. 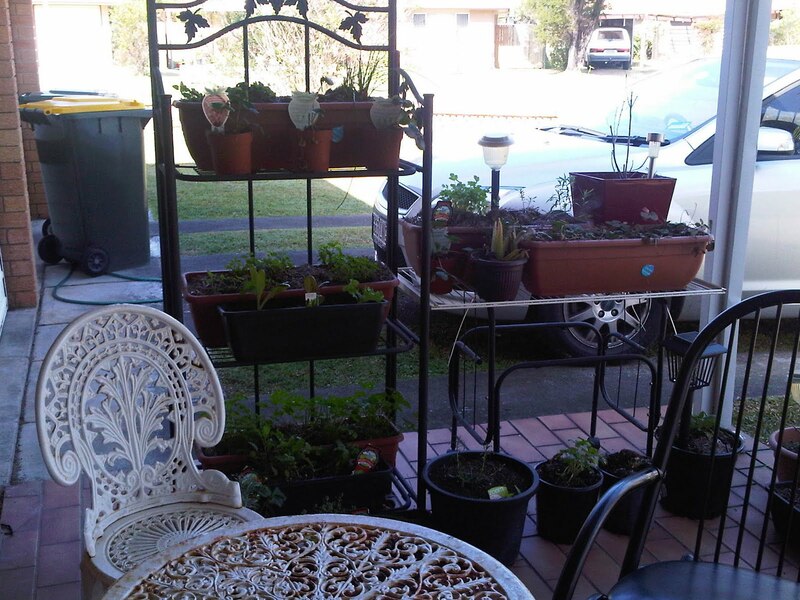 In theory, the yard in this house has enough space to grow heaps of fresh veges. In practice, the limiting factor is my energy in gardening. One way I've found to have at least a limited version of what I would love to have, is to grow the plants in pots. I've got herbs and strawberries, cherry tomatoes and a chilli plant, and dwarf citrus all in pots around my front patio. Instead of digging a garden bed, I fill a small pot. One of my friends has an amazing skill at finding anything I need either cheaply or for nothing. One of her chief sources is going around before the big City Council clean-ups to pick up useful things from the footpath and recycle them. She has set me up a potting bench in the back courtyard - all of my tools, everything I need to pot up new seedlings is at the right height that I don't have to bend or stretch for my pottering around. She's also found me some very pretty shelves so I can fit all my potted plants together on the patio, conveniently and easily able to access to water and to harvest. My gardening is done with very small bursts of energy, and confined in a very small space. And I may not be able to pick all of my fruit and veges fresh. But I do have the pleasure of lovely fresh herbs, and the occasional fresh piece of fruit. And I have a lovely spot on the patio for my morning tea. Now, if I owned the house, there'd be a couple of chooks running around the yard, eating vegetable scraps and laying yummy fresh eggs!